There are now only five days to go until the start pop stage five of the run around the world! The to do list is getting smaller and I've heard that Chappie has cleared customs in Serbia. On that subject, thank you to the British Embassy in Belgrade and also my friends at Virgin Money for helping with the final bit of red tape needed to get Chappie into Serbia. It's another brilliant example of a sponsor of mine being #morethanasponsor. That's a hash tag that I've felt inclined to use quite a bit recently. Another major thing that was ticked off the to do list was finalising my insurance. This task has taken a lot longer to complete but it was hugely important that I obtained an adequate level of cover for the task ahead. It was the most expensive insurance policy that I've ever signed up to but it should give everyone peace of mind. Just like the previous three such policies for the run around the world let's hope that it isn't needed. Back to the subject of sponsors, and I paid a visit to my main sponsor SOS Group today. To say that SOS have been very supportive of my running is an absolute understatement. It was brilliant to be able to thank them for their support in person before I leave for Belgrade on Friday. As well as some final thank yous, I was presented with my new kit from director Andrew Skelton (pictured below). It was good to see that he was wearing the now sold out special edition Run Geordie Run t-shirt for the proceedings. For reasons of practicality and comfort I've decided to run in a cycling top this time. My new kit comes in various sizes to ensure that it's a decent fit all throughout the run. I'll be losing a huge amount of weight yet again. My estimate is six stone and approximately 20% of body fat. I'll be getting weighed tomorrow morning at Primal Fitness to give me an idea of what the start weight is. Thanks to Andrew for taking time out to hand the kit over. He appears to be a very busy man at the minute but, despite that, has been able to help me get Chappie for various visits here and there this last month with the help of one of his SOS vans. That's on top of all of the other charitable causes and sporting events that the company are involved with. Thanks SOS for your brilliant support. 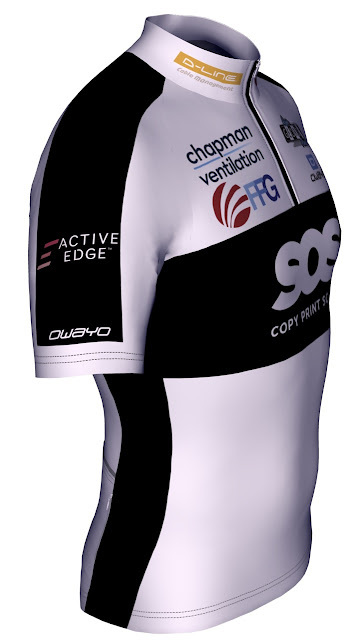 If you'd like to take a 3D tour of my new kit then please click the images below. 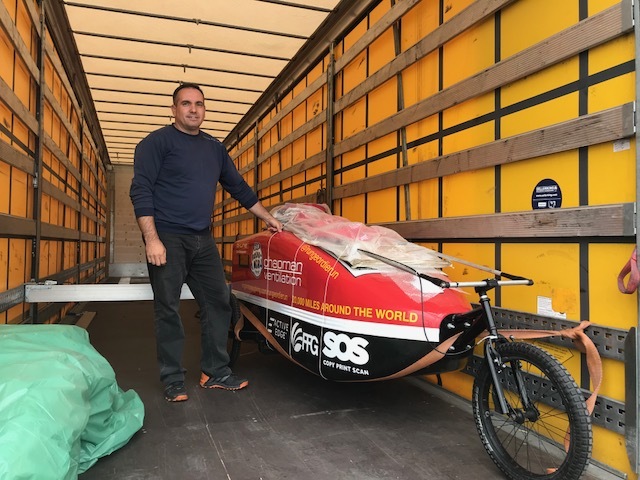 Chappie left the North East of England last Wednesday on the long journey to the drop off point at the British Embassy in Belgrade. The estimated time of arrival in Serbia is this Friday, just after I land in the country. I received a telephone call this morning to say that there was an issue at the border crossing into Serbia from Croatia. The particular problem is that the packing list that accompanies Chappie says that he is a "three wheeled sled". This conflicts with what customs officers were seeing. Specifically, they thought they were seeing a "bicycle". 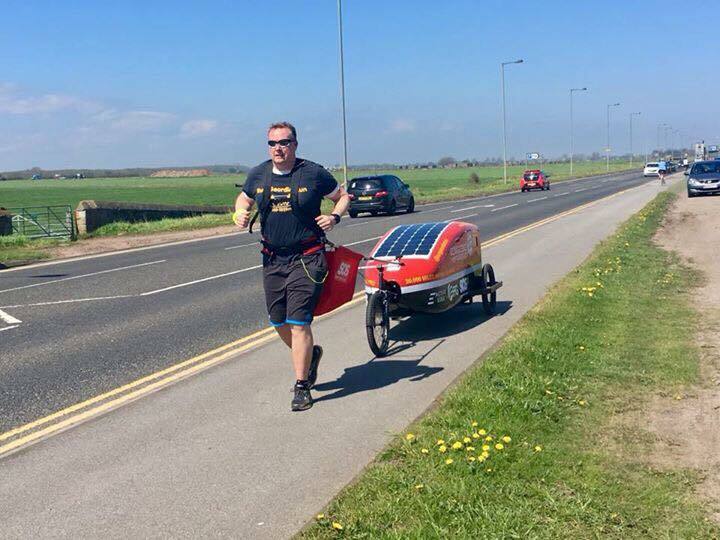 If you consider the image below, taken last week, I suppose if you didn't know what the run around the world was all about then, yes, you may mistake Chappie for a bicycle. I haven't had an update on Chappie's whereabouts since the customs issue this morning. Hopefully, he'll arrive safe and sound in Belgrade tomorrow. Watch this space for more news as and when I get it. 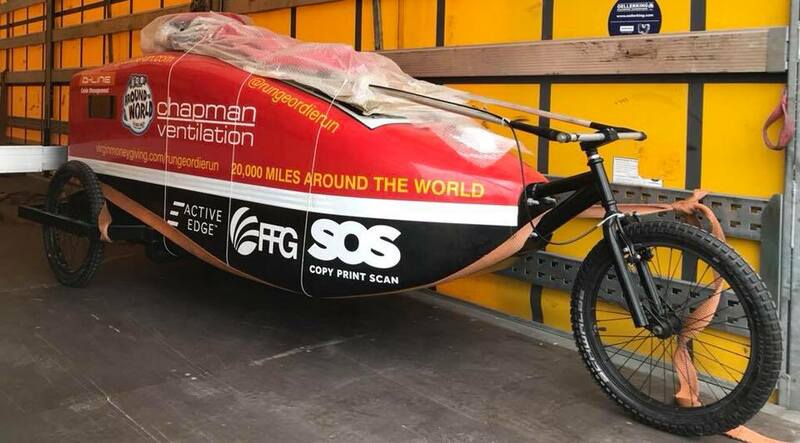 I've got six days of final preparations to complete before stage five of the run around the world starts in Belgrade, Serbia. 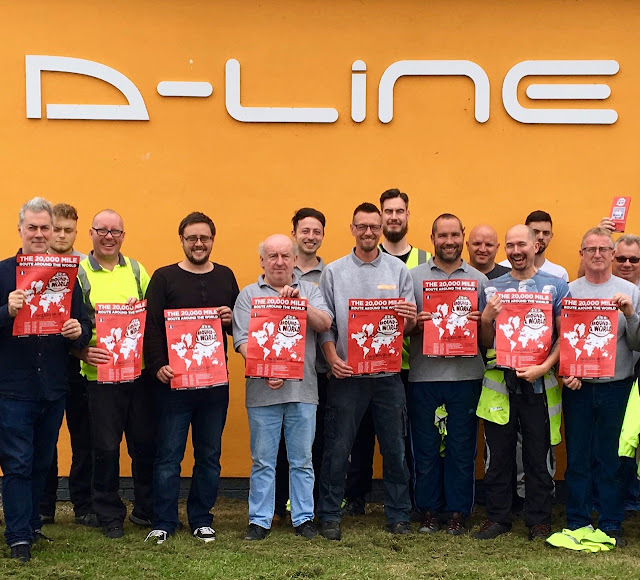 Amongst today's tasks was to make a visit to my sponsor D-Line in North Tyneside. Regular readers will know that D-line supported me on stage four and have very kindly offered further support for this current stage. D-Line are all about invention and innovation in my opinion. Despite being a local company, their range of cable management products are shipped all over the world. Their strategy of using innovation to drive success aligns very much with my own. Our partnership is one that has grown stronger over the last few years and without them the charity total would not be as high as it is. A very good recent example of this was when they paid the £688 production costs of the latest Run Geordie Run t-shirt. This meant that a very pleasing £1800 was raised for St Benedict's Hospice as a result. That's a brilliant return on their spend and I'm hugely grateful to them. D-Line are also sponsors of rungeordierun.com and all proceeds from that deal have gone to charity. Back to today and it was brilliant to talk to the room full of D-Line staff about my run around the world. There were some excellent questions put to me. This of course meant that I was able to tell some stories, that aren't often heard in my talks (mainly because I talk to a lot of schools and colleges). My particular favourites are from the run across the USA. 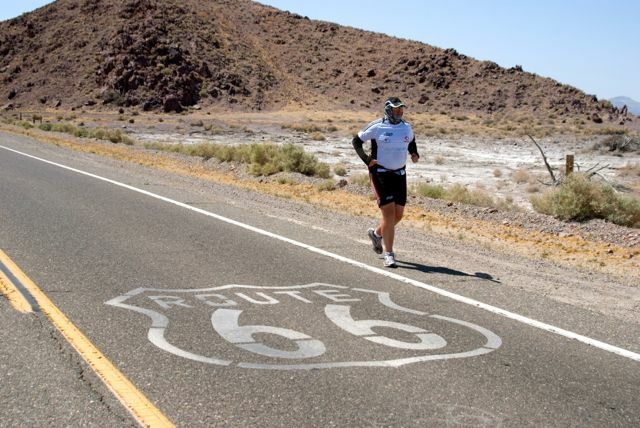 I talked about the encounter with the "weirdos" on route 66, the drugs bust in Oro Grande, being quesitoned at gun point in the Mojave Desert and the gang that I met in Springfield, Ohio. They are all great anecdotes in their own right and will surely have to feature in a book one day. I also talked about how the world run came about, some of the other stages and of course why I raise funds for St Benedict's Hospice. Such was the great turnout, I think the entire company must have shut down for an hour! Thank you to everyone who contributed to the whip round for St Benedict's Hospice and also to D-Line for very kindly matching their staff's donations. The picture below shows some of the staff holding the new information leaflets that have been created for the next stage. I'll leave the final word with my sponsor D-Line - "D-Line is a UK company with a global reputation for innovative cable management products. Our range includes the world’s fastest cable trunking systems, as used by trade and consumers, to hide and protect cables in ways that blend with modern surrounds. Market-leading fire-rated Safe-D Clips secure cables, while eliminating the risk of fires causing potentially fatal cable entanglements. 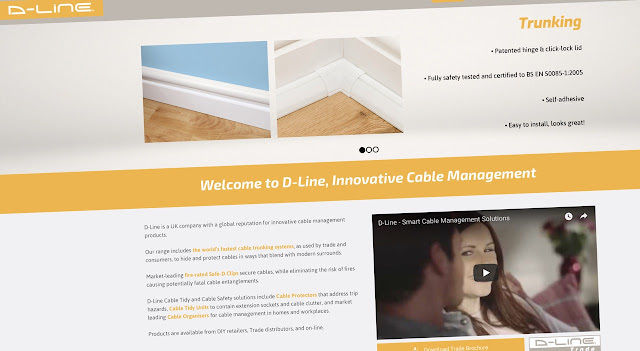 D-Line Cable Tidy and Cable Safety solutions include Cable Protectors that address trip hazards, Cable Tidy Units to contain extension sockets and cable clutter, and market leading Cable Organisers for cable management in homes and workplaces." 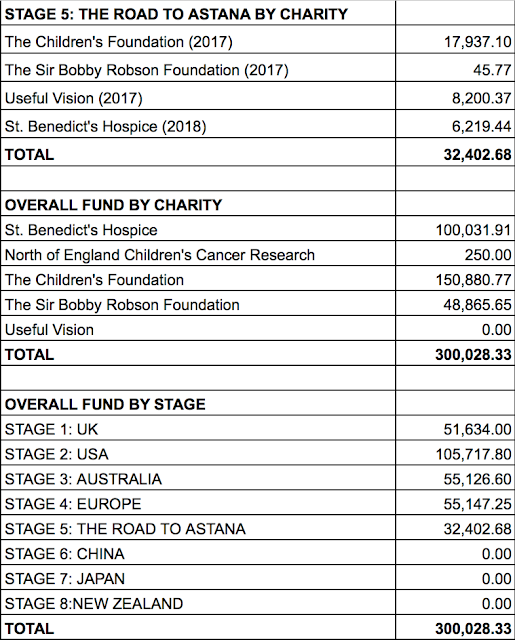 Over the years, Run Geordie Run t-shirts have raised £32,000 for local charities such as St Benedict's Hospice, The Children's Foundation, The Sir Bobby Robson Foundation and Useful Vision. 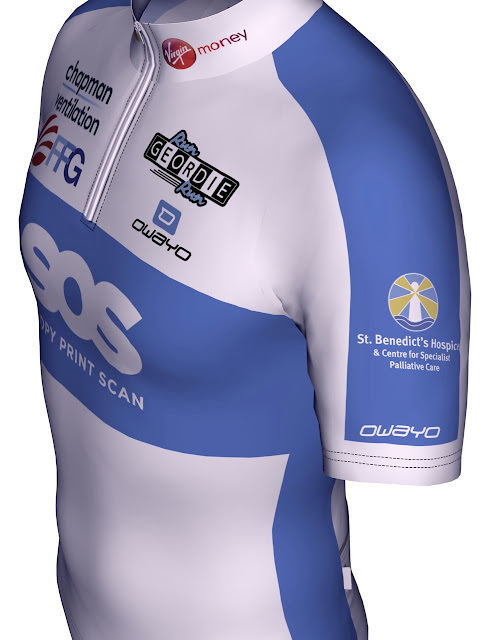 This latest design (once again by Dave at Shenton Creative) commemorates the fifth stage of the run around the world, the so called "Road to Astana" and has raised a brilliant £1800 for St Benedict's Hospice. The snazzy red technical fabric garment features the 2900 mile route from Belgrade to Astana on the back of the t-shirt as well as the Run Geordie Run Around The World and St Benedict's Hospice logo on the front. I'm sure you'll agree that it's another brilliant design and I'd like to say a huge thank you to Dave at Shenton Creative for his efforts. Efforts, by the way, that have helped raise tens of thousands of pounds for charity. 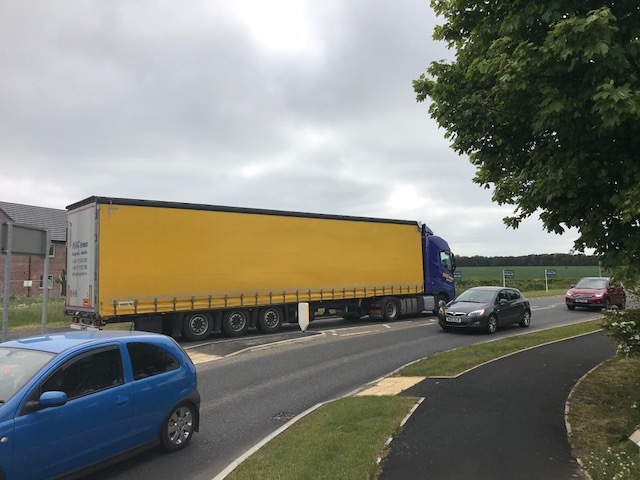 An absolutely massive thank you goes to my sponsor D-Line who paid for all production costs and sponsor Fresh Freight Group who are looking after the postage and packing. In time honoured Run Geordie Run tradition this means that every penny that the t-shirts have raised has gone directly to St Benedict's Hospice. Finally, thank you to everyone who has bought a t-shirt. This particular design has now sold out. Your support is hugely appreciated by myself and St Benedict's Hospice. I’ll be saying a temporary farewell to my buggy, Chappie, later today as he begins the long journey to the British Embassy in Belgrade on the back of a lorry. Regular followers will remember that Chappie is the short name for the Chapman Ventilation Around The World Buggy. 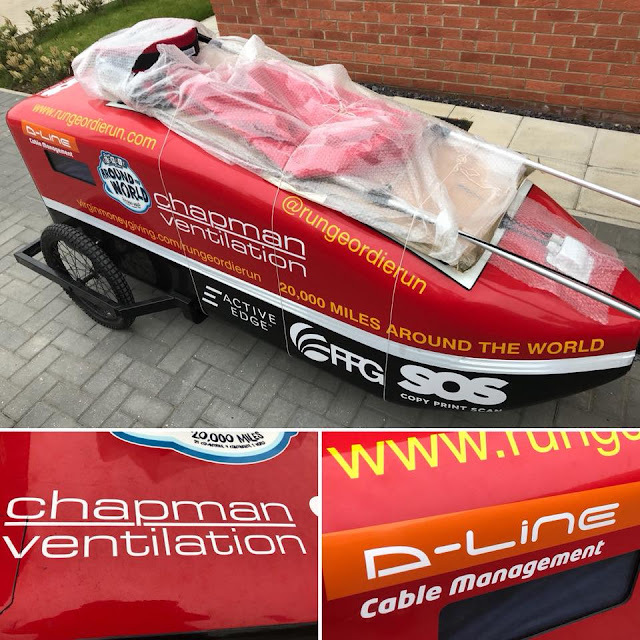 Chapman Ventilation, who have backed me over 3 stages of the run around the world so far, very kindly paid for all production costs of Chappie. A huge thank you to them for helping to turn a pipe dream of running the remaining 11,000 miles around the world unsupported into a reality. 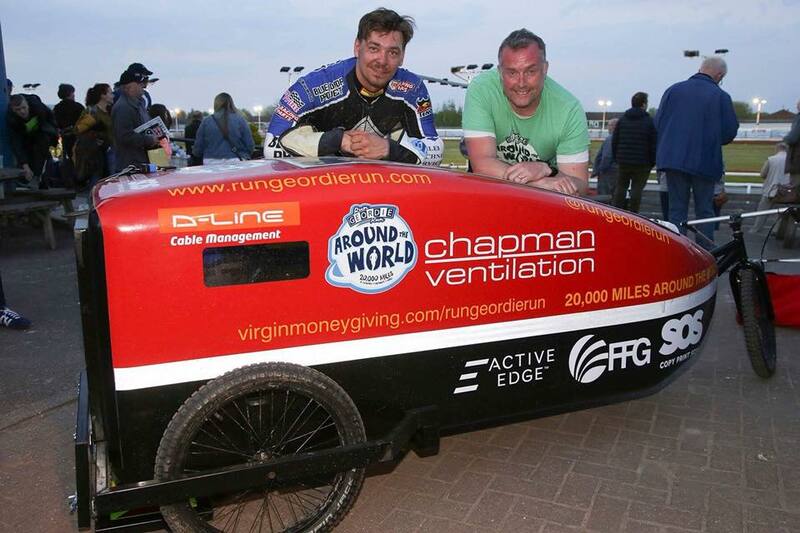 Chapman Ventilation already do so much for good causes and I'm eternally grateful to them for their continued support. I'll be reunited with Chappie in Belgrade on the afternoon of June 1st. I'll be flying out from Newcastle Airport a little earlier at 0600. 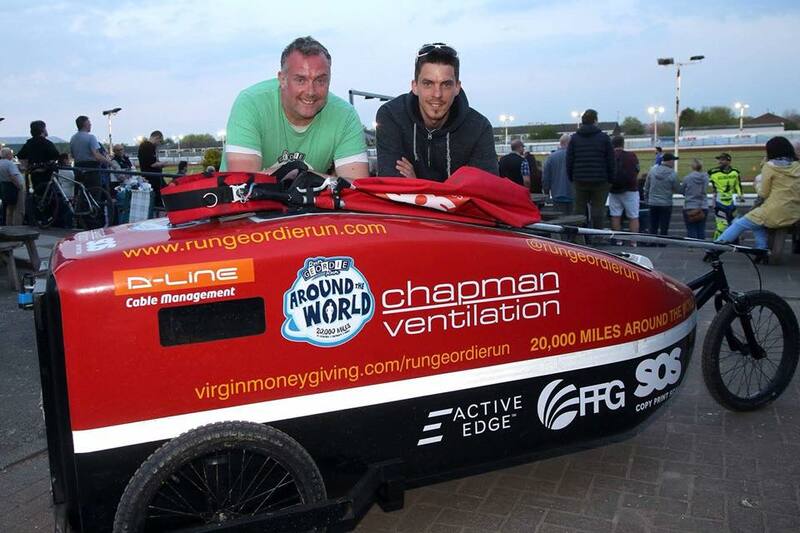 I'll also be joined by Carlton Fletcher who was on the support team on stages 2 (USA), 3 (Australia) and 4 (Europe) of the run around the world. Carlton is going to help me with the final prep in Belgrade and will be running the first few miles with me on June 4th before heading back to the UK. Thanks to Carlton for his unwavering support of my running. Thanks also go to the many people who have sent me messages of support via email or via social media. It's brilliant to know that there continues to be a lot of interest in my running. I’ve been asked many times recently how I feel about running 2900 miles unsupported from Serbia to Kazakhstan. It’s a feeling that’s hard to describe. It a mixture of excitement, determination and pride. There are no nerves yet and I think it’s really helped that I’ve broken the run down in my mind into so many small sections. I will quite literally be taking it one mile at a time never mind one day at a time. Thank you to the individuals who have been in touch with offers of help along the route. I've been following up on these and it looks like I'll have a place to stay in Kiev on my rest days and also some school visits to carry out in Ukraine. There are other leads to chase up in Russia and Kazakhstan. Thanks to Synergy Language Services for translating my leaflet into Russian. This leaflet (and also the English version) was designed by Dave at Shenton Creative and is being printed by Communisis in partnership with PBL Print and Photoline. The leaflet is going to be my main method of communication on the Road to Astana. The tri-fold pages can be viewed online here and the poster foldout can be viewed here. I'll leave the final words to Catrina from St Benedict's Hospice who summed up to me last week exactly what they and the wider hospice movement is all about. Please take 60 seconds to watch it. There are only two weeks to go before stage five of the run around the world gets underway in Belgrade, Serbia. While the final bits of planning and preparation are going well and I must say that the fundraising has exceeded my expectations way beyond what I ever imagined. It gives me great pride to report that the overall around the world fund passed through the £300,000 barrier this morning as the final few special edition t-shirts were sold. It's not only me that should be filled with pride but everyone who has sponsored me over the years and donated to one of my chosen charities. Without the support of friends, colleagues, family and the wider general public none of this would have been possible. 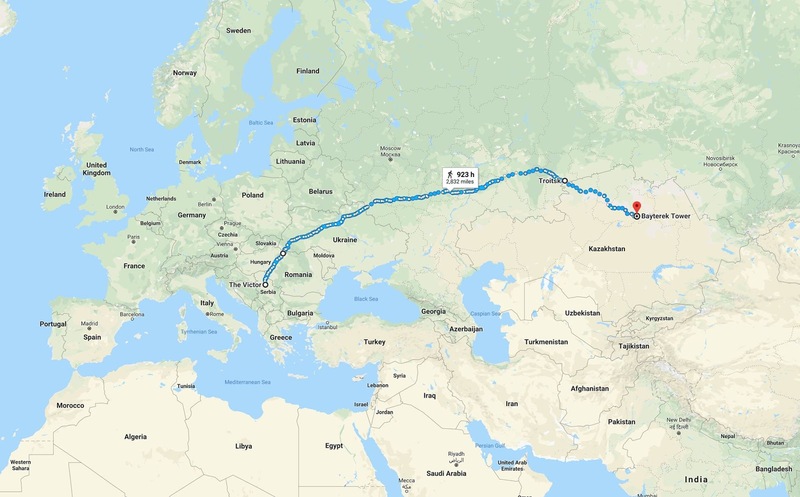 Despite the amazing overall milestone of £300,000 being hit, there is still some way to go to hit my own personal target of £50,000 for the Road to Astana campaign. As per usual, I will be trying my absolute best to hit that target when stage 5 gets underway on June 4th 2018. It won't be possible without the amazing generosity of the general public. It's a generosity that I never have and never will take for granted. 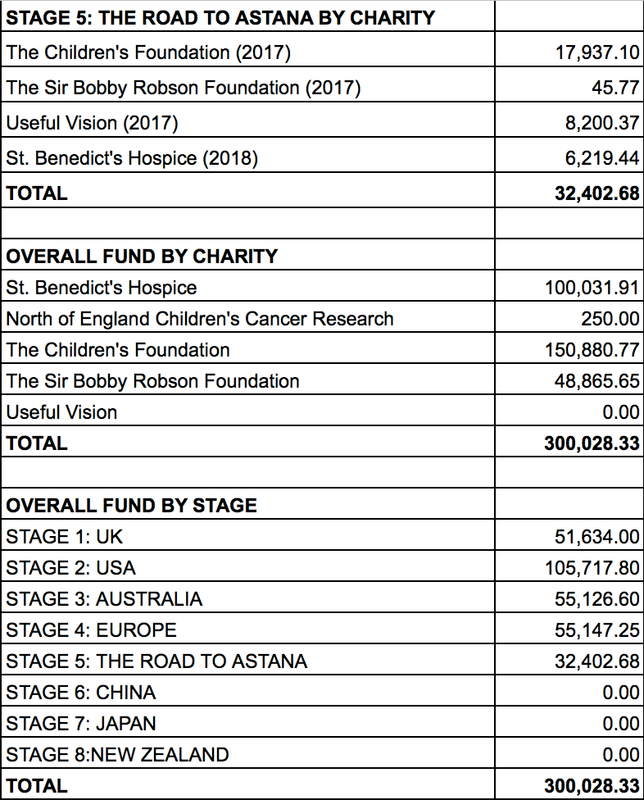 I should also mention that, as a result of using Virgin Money Giving (as opposed to other equivalent fund raising sites) to fundraise for the recent campaigns approximately £6,500 extra has been passed to the charities. Finally, thanks so much if you've ever sponsored me. The totals below show where your money has gone. So it’s the morning after the day before. Yesterday’s 22 miles really serves as a reminder just how tough stage 5 of the Run Around The World is going to be when it gets under way in 28 days time. The task ahead is simple to explain. I’ve got 100 days to run from Belgrade through Serbia, Romania, Ukraine, Russia and Kazakhstan to Astana. I’ll be running 31 miles per day which will allow me to take 7 rest days during the 100 day period. And of course, I’ll be pulling a fully laden buggy weighing in at 110kg (17.3 stone). After yesterday’s 22 mile training run with Chappie (my Buggy) I felt very tired this morning. Really tired in fact. It’s a familiar tiredness that I’ve faced many times before during the 8,991 miles ran around the world so far. I shuddered knowing that I have to run 9 more miles per day over a 100 day period. If ever I needed a reminder as to how tough the task ahead is going to be, then yesterday was it. 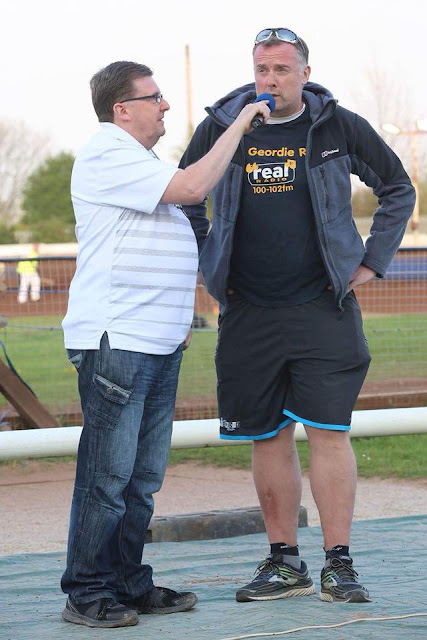 I must admit that it was a nice end to the run yesterday when I found myself at Brough Park to watch the Newcastle Diamonds take on the Ipswich Witches. The racing provided the usual level of excitement. It was great to be interviewed trackside after heat 8. Thanks Roy for asking some great questions. The hero of the day with a brilliant final heat was captain Ludvig Lindgren who tipped off a great race meeting with a win that saw Newcastle complete a comeback to get a draw. 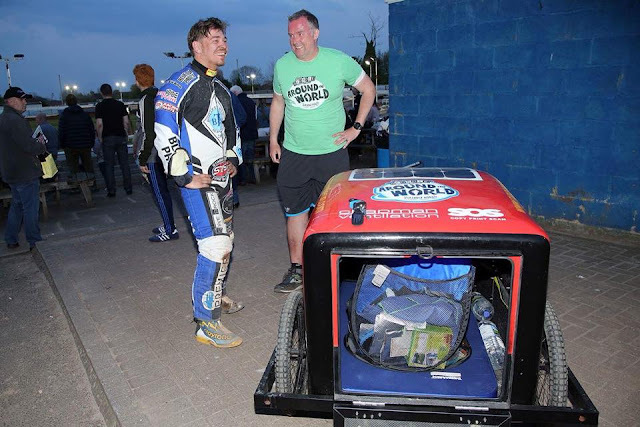 The best part of the day for me was when Ludvig Lindgren took time out after the meeting to come and have a look at Chappie. He asked some great questions about my up and coming run and what life is like living in a buggy. I spent a lot of time talking to former Diamond Matěj Kůs (who was my favourite rider when I started attending the speedway 2 years ago). We chatted about the task ahead and he also talked about his recent experiences in Russia and the people that he encountered. To be able to spend some quality time with your heroes is quite amazing really. Thanks go to Steve Brock and Roy Clarke for setting things up at Brough Park. Thanks to Bob Beecroft for giving Chappie a lift home in his van. This meant that I didn’t have to run 14 miles home today. It also means that I’ve got time to carry out some important tasks today such as booking some flights. Thanks also go to everyone who put some money in Chappie’s basket yesterday. All in all it was a very tough but enjoyable day. Whenever there is money being raised for St. Benedict's Hospice it’s always going to be a great day. The Diamonds fightback and meeting my heroes was the icing on the cake. You can see the 22 mile training route that I took below.